Our programmes encompass all the issues that we wish to address in Kenya and Tanzania. We aim to improve household income, nutrition, health and sanitation, education and unemployment. Our model and approach to these issuesis trusted by the community. That's why we are successfully changing lives. We conduct research, listen to peoples' ownideas and then work together to make these ideas a reality. Only 2.7% of families have their own fruit and vegetable gardens. 38% of rural families in Rachuonyo District keep cows to benefit from the sale of milk. Only 4.8% of rural small holders claimed to grow field crops as a source of household income. 80% of farmers lack additional agricultural inputs such as fertiliser or new seed varieties due poor access and unaffordability. Government HIV testing outreach is poor, there is no standardised policy of sexual health education in schools and there is a lack of provision of adequate water and toilet facilities, school absence from illness and menstruation is common. 62% of primary schools have no on site water and are deficient by over 150 girls’ toilets. 61% of young people claim to use no form of contraception. 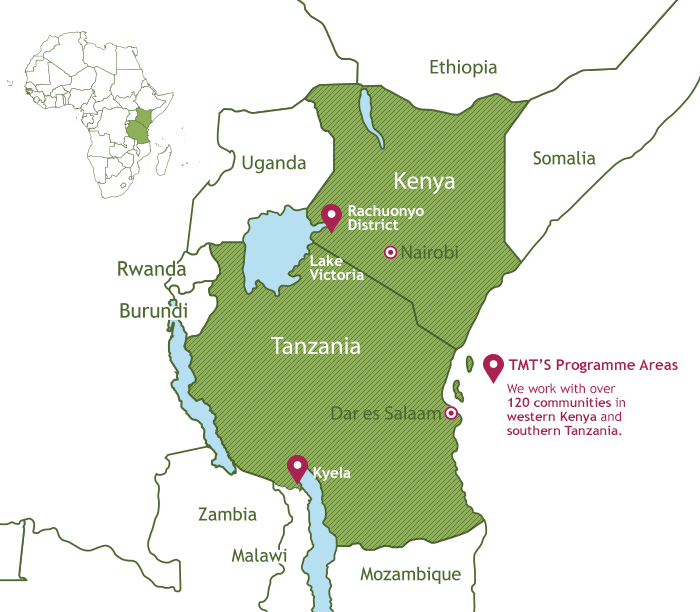 31% of people tested by TMT in Kenya were HIV+. 48% malaria prevalence in Rachuonyo District. 65% of rural families rely on unboiled river water. 67% of Kenyan school children share a desk with another child. Teacher-pupil ratios in many schools are as high as 1:60. 60% of primary school pupils fail to get sufficient grades to get into secondary school. One in 5 girls drop out of school before completing secondary education. 60% of students sitting their Kenya Certificate of Secondary Education (KCSE) examinations end up scoring below 49% (C-) reducing their chance of getting a vacancy in higher education. 21.5% of OVC guardians we interviewed engage in unsustainable casual or hazardous labour activities. 53% had either, incomplete or no primary education, 62% had no secondary education. Sand mining results in soil erosion, deforestation, flooding, degraded water and loss of bio-diversity. Water hyacinth growth in Lake Victoria has led to a substantial decline in Tilapia fishing.